In That’s My Boy, Jerry Lewis plays the part of “Junior” Jackson, a non-athlete who lives in the shadow of his father’s college football days — and his father plans to relive his glory days through his son, Junior, whether Junior wants to or not. Dean Martin plays the part of Bill Baker, a natural athlete who would likely be All-American. If he could only afford to attend college. Junior’s father decides to solve his problem by paying for Bill’s college, with the condition that Bill rooms with Junior, and tutors him on the field. A complication arises when both of them begin to fall in love with the same girl … beautiful co-ed Terry Howard (Marion Marshall), who agrees to help build up Junior’s confidence. It’s a film that’s both funny and heart-touching, both for those of us with sons and those of us with fathers — I recommend it. 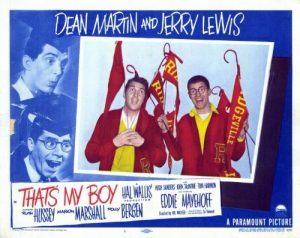 That’s My Boy is available on DVD on the Dean Martin and Jerry Lewis Collection Volume 1. Dr. Benjamin Green: The average normal child often resents his parents. Some children often wish they had different parents. Some children even hate their parents. Jarring Jack Jackson: What about Junior? He hates me? Dr. Benjamin Green: Hates you? The only advice I can give is never take your boy hunting. Coach Wheeler: Must you wear glasses? ‘Junior’ Jackson (Jerry Lewis): No, sir. Only when I want to see. Football great Frank Gifford doubled for Jerry Lewis in the kicking scenes. In November 1951 Jimmy Durante sued Wallis-Hazen, Inc. for $350,000 in damages. He claimed that the expression “That’s my boy” had bee identified with him since 1943, when he was a regular on Garry Moore’s radio show.